Book Cover Reveal: THE GOOD NEIGHBOR! You are here: Home / Amy Sue Nathan / Book Cover Reveal: THE GOOD NEIGHBOR! I’m thrilled to finally be able to share with you (if you haven’t seen it on Facebook or Twitter) the publication date and cover for The Good Neighbor! The official pub date is October 13, 2015 but you can pre-order now on B&N and Amazon! Right now it’s just the paperback (ah, technology!) so I’ll let you know when the e-book pre-order buttons go live! I love the cover! I would pick it up for the cover alone. I can’t wait to get it. I still prefer paperbacks!! On my way to Amazon. The cover is Nice! Very intriguing and wonderful color! Congratulations, Amy. It’s a lovely cover. I love the cover! I want to knock and enter this new world of Amy’s! Lover the color and the simplicity of the design. It will really stick in my mind until I buy it. Absolutely gorgeous cover, Amy. Exactly the sort that would make me pick up your book! The colour alone would make me pick it up. Beautiful cover, Amy! Gorgeous cover! I can’t wait to get my hands on it. Heading over to Amazon to pre-order. BTW – loved THE GLASS WIVES! It’s just beautiful, Amy. I love doors…so much promise and intrigue. And I love the book! Congratulations! So happy to see that your next novel is coming out–and with such grand style! Congratulations, Amy! I am so excited for you. Can’t wait to read this. I love your cover! I’m looking forward to reading the blurbs of The Good Neighbor. 🙂 All the best! Beautiful cover but something tells me the neighbor is not so good! Great cover. 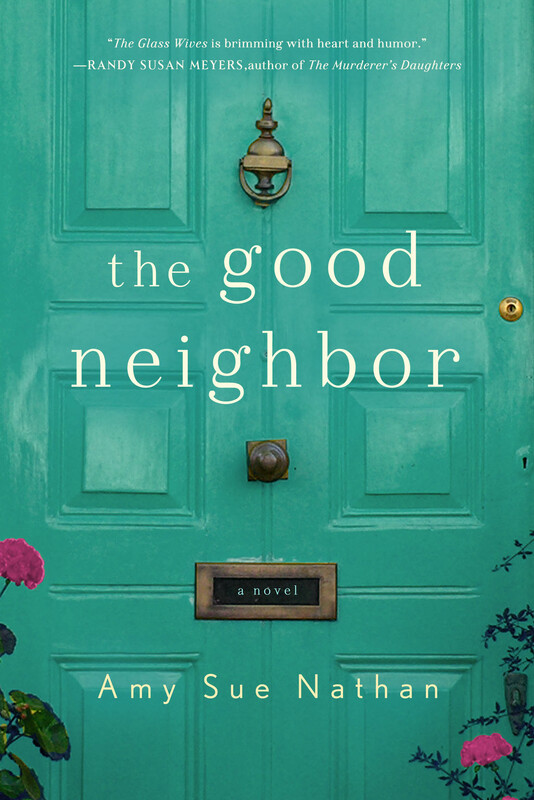 I loved Glass Wives; I am looking forward to reading The Good Neighbor. I will preorder the paperback then preorder the-book later. The book I will send to my daughter who is always looking for good books. The e-book is for me. Congratulations! How exciting! Gorgeous! What fabulous cover, Amy!